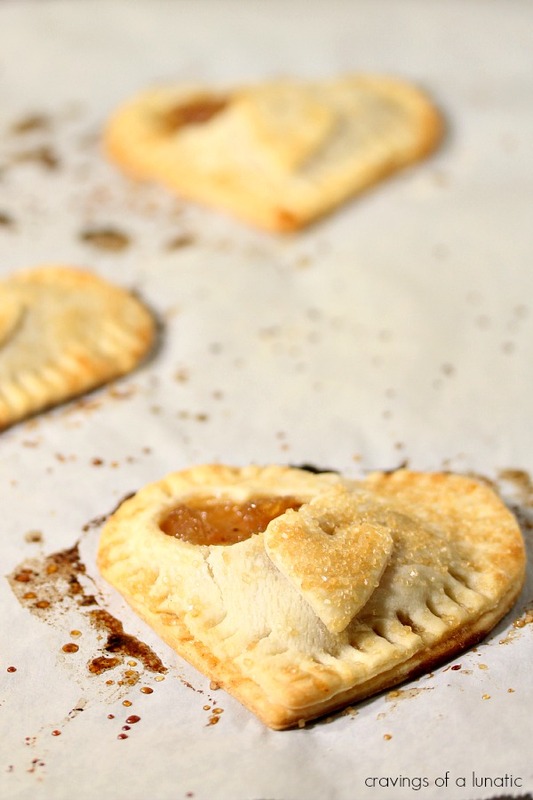 Cute little Apple Hand Pies that are easy to make and wicked adorable! When Erin of Dinners, Dishes and Desserts contacted me to be part of her Thanksgiving Potluck I said yes immediately. Erin is an amazing blogger friend and I love any chance to work with her on a project. When I found out it was to tie in to Feeding America it just made the cause even more special. Feeding America is a great organization, highly regarded and supported by the foodie community at large. In fact it’s the nation’s largest hunger relief charity. Their mission is to feed the hungry and get people like you involved to help end hunger. So I’m honoured to post today and help shed a little light on a good cause. We’ve struggled in our lives personally. I actually know what it’s like not to have money for food. I can tell you from personal experience it is painful to go through. We were lucky to have family to help us through an incredibly difficult time in our lives and I am ever grateful for that. Not everyone has that kind of support so organizations like Feeding America are very important. If you can help in any way, big or small, please go to their website to learn how you can help this great cause. When I was deciding what to make my mind went immediately to apple pie. 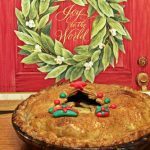 Any time I think of holidays I always think “comfort food”, and apple pie is right there at the top of my list. My daughter, Mini-me, is a huge apple pie fan. It’s her go to dessert for holidays and special occasions. Pie just makes a bad day better. It’s relatively inexpensive to make and it just makes Thanksgiving, or any holiday for that matter, better. 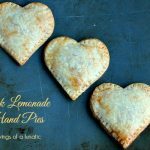 I decided to make them into hand pies since it makes them portable. Hubs and mini-me can take them to work and school. No mess, no need for a spoon. They are super easy to pack, and to eat. They couldn’t wait to dive into them. I hope you feel the same way! Line two cookie sheets with parchment, set aside. In a large pan over medium heat add the butter, let it start to melt a bit. Then toss in your apples, both sugars, lemon juice and salt. Cook this for about 5 to 7 minutes, until the apples soften and the mixture starts to brown up a bit.Add your cinnamon and nutmeg. If it's overly watery (depends on the kind of apples you used) you can drain off some excess liquid. If there's only a little bit of juice add about 1 teaspoon of corn starch and allow that to cook for a minute or two to thicken it up. You can add more if needed. Take off the heat and allow to stand till needed. On a lightly floured surface, roll out your pie dough. I used cookie cutters to cut out my shapes. Cut two for each pie. Depending on your cutter size it should make 8 to 12 pies. Remember to cut double so you have a top and bottom piece. If you have a mini cutter you can cut a fun shape in for steam. Place the bottom layers on the cookie sheet. Now spoon about 1 tablespoon of the fried apples into each pie shape. Keep it sort of in the middle so you don't have pie mixture around the edge, that needs to be clean to pinch the pies. Now take the top layers and pop them over each shape. With your fingers press down around the edges of all the pies. For good measure go around them with a fork dipped in a touch of flour or water. Now melt the remaining 2 tablespoons of butter in a saucepan. Brush that butter over top of each pie shape. Sprinkle some demerara sugar over top. Pop in the oven for about 12 to 15 depending on the size of the cookie cutter you used to cut out your shapes. Start keeping an eye around 8 minutes in case yours in way smaller than mine was. If desired you can sprinkle them with powdered sugar. 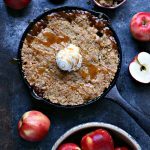 Serve with a big old apple pie loving smile! Please take some time to visit all the other Thanksgiving Potluck Participants to see what they whipped up for you today. It’s an amazing bunch of bloggers involved so show them some love! Make sure you enter the giveaway below. Giveaway is open till midnight on November 25, 2013. Winners picked by random.org. Thanks to Anolon and Wusthof for donating these amazing prizes. So clever! These would make a great take-home from Thanksgiving dinner … thanks for the idea! Thanks Karen. I love hand pies. Completely addicted to them this year. I hope this is how you enter! My family would benefit from some new, amazing cookware. 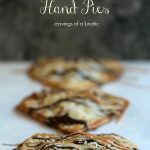 The hand pies look amazing. Thank you for sharing your story of struggle. We are also struggling since we’ve been plagued with job loss recently. Happy Thanksgiving! Hey Danielle. The giveaway widget was whackadoodle yesterday. If you can pop back and enter inside the widget that would be great. It will generate the winners randomly from there. I am so sorry about your struggles. We went through it in recent years. My hubs worked in the auto industry, things went south, he went back to school, then could not find work. He’s finally back working and things seem to be looking up. So I’m hopeful the same happens with you. I know it took a toll on us so I have so much empathy for you. You’ve got a sympathetic ear if you ever need it. Thank you so much for joining us today Kim!! I love these pies, they are perfect comfort food. I know you have a lot going on right now, so I really appreciate you taking the time out to share! these are cute 🙂 my son and I will definitely be making these! Yeah, so glad to hear that. They are really yummy. I like the fried apples in it. Makes for a softer filling. Awe, thanks Carla. They were so fun to make, and eat. I tried entering before but had trouble with the widget you guys are using, so I’m just going to leave a comment instead. I love your pies. They’re so, so cute. I would enjoy them more than regular pie, truth be told. Come back and try again lady. My whole post got thrown out of whack by the raffle thing. Thanks for giving me a heads up today. It knocked off my ads for hours on end. I had no idea. I love hand pies. I have another one in the works. More pie, happier Kim. These are wonderful! I love apple pie and transportable pie is even better. Well done! The cause is an important one. Everyone should have enough to eat. Thanks Maureen. I love hand pies. There’s just something so cute about them. My thoughts exactly. It’s rough when you can’t afford to eat. Been there, one of the hardest things we ever dealt with. So many people struggle in life. It’s great to keep things in perspective and be able to give back a bit. 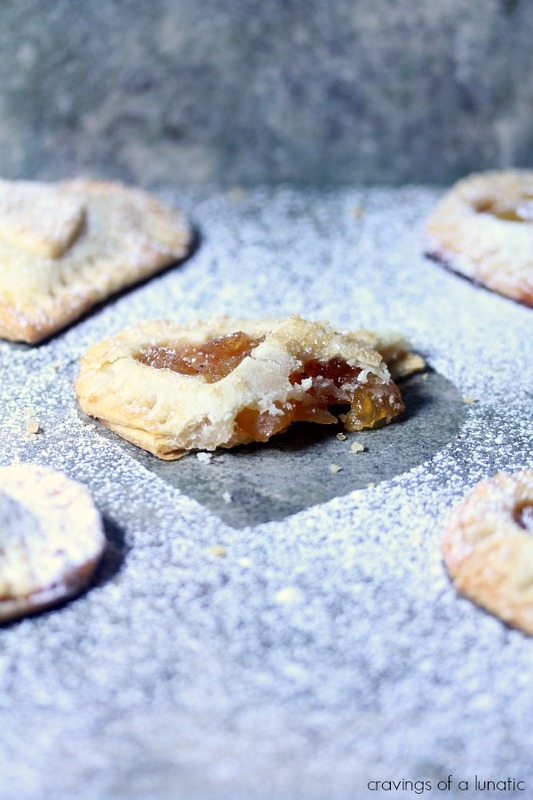 Kim, these little apple pies look so perfect for Thanksgiving breakfast or dessert! I love the idea of everyone having their own mini pie instead of a big slab. So elegant! Thanks Georgia. I am so addicted to hand pies this year. I think it’s the idea of everyone having their own pie. It’s just too adorable. Thank you for sharing your story Kim, and for this important reminder to give back. This little pies are adorable, and I love that I don’t even need a spoon–less dishes! I just can’t imagine what it’d be like not to have family to help in tough times. 🙁 I’m happy yours was there to help! And these pies look fantastic. Bravo on getting the post up and sorry that you had to rewrite it! Seeing that you’ve lost a post is one of the worst blogging-feelings ever. Me either Erin. We were really lucky through our rough patch. Got pretty tense for awhile, almost lost our house. I’m super grateful we were able to pull through and life is looking up again. Makes you appreciate the little things in life. Oh, yeah! 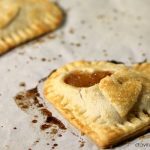 I’d take an apple hand pie over chocolate every.single.time! These will fit into your suitcase for a special delivery, right???? Ha, you crack me up Liz. I love apple. And cherry. And blueberry. And chocolate. Pretty much any kind of pie. Lol, these may not but I have something else for you. I can’t wait to see you. This weekend should be so much fun. Just cross fingers tummy behaves. Oh, and I just got the car confirmation from you. I was cleaning out some emails and was like “who the heck sent me a …oh it’s Liz.”. Every time I see Elizabeth it doesn’t register. You should legally change it to Mama Liz. Ha! LOVE to enter contests. 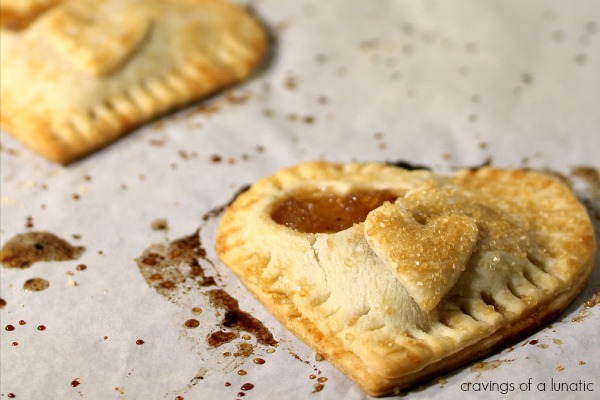 These heart shaped pies are ADORABLE. Me too. Winning things is so much fun. Thanks. I had a ton of fun making them. Looks and sounds delious. Thanks for sharing. Thanks so much for visiting Roxane. Thanks Uru. I love me some hand pies. I have tons of apple pie mix in my freezer. These would be adorable to make! I love a mini dessert, especially one that’s portable and fits in the palm of my hand 🙂 These are the cutest! Aw, so cute! Who wouldn’t want their own little pie? Good recipe, and that’s a great cause. Right. I love these little pies. I’m making mini pies all the time now. So fun. So how many of these am I allowed in one sitting? 🙂 Nothing like your own personal apple pies. these look delicious! Ha, as many as you like lady. I love hand pies, such a weakness for them these days. I love the Feeding America cause. It’s such a great cause. 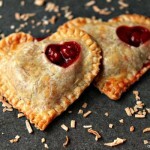 These hand pies are too cute. Me too. Causes like this just change the world, and let’s face it, the world needs some changing. One step at a time. Thanks. I love hand pies. It’s my go to dessert these days. 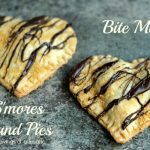 These look so good!These pies are so cute-luv them.